I like food, but I am not much of a cook. I’ve learned to appreciate paying an expert to prepare food the same way I learned to appreciate paying talented folks for quality work in my professional life. 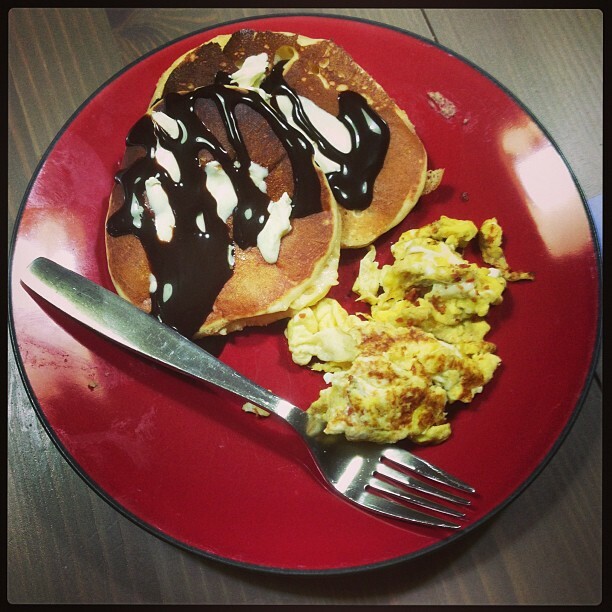 On Monday I made a dinner of pancakes and eggs. I used to pretty much only eat eggs when I was single, because it was fast and tasted delicious, and more importantly it was easy to prepare. When I found myself at home alone with the boys on Monday, I decided to roll back to my bachelor ways and make things the way I used to: fast, furious, and with bacon bits. Fast and furious it was, but simple it was not. I’m not sure how widely known it is that January 24th is National Peanut Butter Day. This was a BIG deal at my house, inspiring my seven-year old to check out a peanut butter cookbook from his school library. In the last week we’ve made a lot of peanut butter, and made many things with peanut butter. Naturally, we decided to make peanut butter pancakes. Peanut butter pancakes are easy. I’m not going to bore you with a recipe. I just put two giant globs of peanut butter into the bowl and mixed it up with some Bisquick and sugar. I did had to apply some elbow grease, but it mixed in fine. Once finished, I prepped the pans, lit the stove and was good to go. This is where things get dicey. I have two boys: a seven-year old, and a 17 month old. On this evening the youngest was hanging in the kitchen, and the eldest was doing his homework. I gave a break to the eldest and asked him to keep an eye on his little brother. He replied “SHORE!” and then proceeded to walk past us and to the bathroom. At this point I had started heating pans and completed a test run of the pancakes, and was prepping my eggs. Lets just say I didn’t move quick enough, and between tossing a ball with the youngest and whisking eggs the pans got too hot, and very quickly there was smoke. In my opinion my smoke detector over reacted to this and soon it was going off while I was opening the window and turning things down. To my surprise, my youngest didn’t scare easily. He ran over to me, I picked him up, and he just looked at me funny and acted annoyed until I turned off the alarm. Once I was able to re-set the oven and get going again, my eldest sauntered out, nearly oblivious. He did pick up where he left off, playing with his younger brother until I served them delicious pancakes with honestly mediocre eggs. I will say this though – the eldest decided Monday night he likes eggs once again, and I was also told that my pancakes taste like fudge – a win in my book. I will also say that my wife is amazing because tonight she did it all herself. Again.